The 12-fight bill at UFC 212: Aldo vs Holloway was held on Saturday June 3 at the Jeunesse Arena in Rio de Janeiro. The five-fight main card aired live on Pay-Per-view, following the four-fight prelims on FS1 and three bouts streamed on UFC Fight Pass. UFC featherweight championship unification was on the line. In the main event a defending UFC featherweight champion Jose Aldo (26-2-0) of Brazil squared off against No.1 ranked Max Holloway (17-3-0) of the US. The latter was also an interim champion. Scheduled for five rounds encounter was a championship unification. The bout ended prior the final bell. 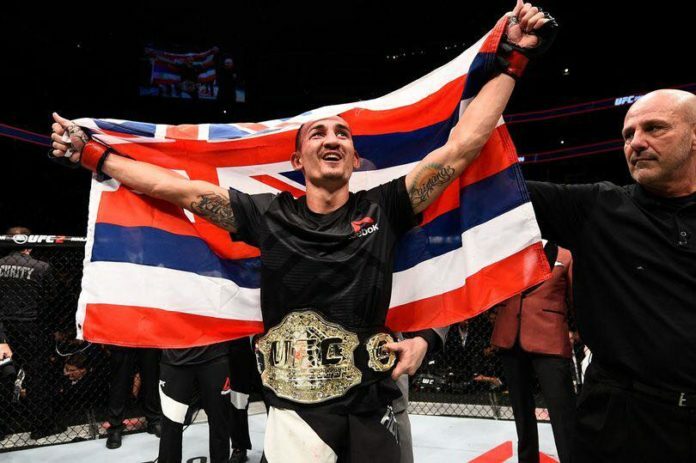 Holloway defeated Aldo by the third-round TKO and as a result was crowned as a new undisputed UFC featherweight champion. The co-main event was a woman’s strawweight contest. A former title challenger and ranked No.1 Claudia Gadelha of Brazil faced off ranked No.2 Karolina Kowalkiewicz of Poland. The bout ended in the third round. The representative of the country-host earned a victory via submission, rare naked choke. Also on the main card Vitor Belfort earned a unanimous decision against Nate Marquardt. As well, Paulo Borrachinha defeated Oluwale Bamgbose by TKO in Round 2. Similarly by the second-round TKO Yancy Mederios claimed a victory against Erick Silva.